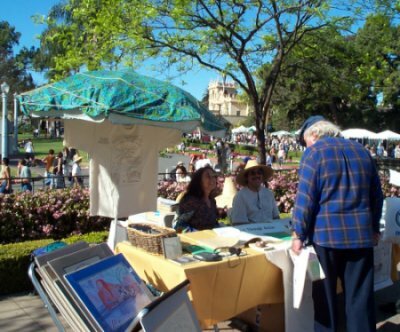 The Earth Fair at Balboa Park in San Diego. Thousands attended. The local newspaper briefly mentioned it in the back pages and featured the Avocado Festival on the page one. The Earth Day organizers do not expect to be popular with the media, which as everyone knows, is owned by the corporate despoilers of the planet and their close cronies. At the booth where I sold my art prints, CDs, t-shirts and posters, I met at least a dozen people who owned a copy of the original Living On The Earth. I am hoping we will all meet again on April 27 at In Harmony Herbs and Spices, when I will have the new books to sign. The most dada moment was an organ concert in the middle of the fair. The Spreckels Organ Pavilion is three stories high, and full to the top with literally thousands of organ pipes. The entire building is a huge resonating cabinet. 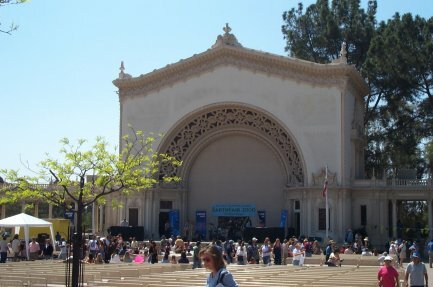 It has the same funereal air of the Palace of Fine Arts in San Francisco, also built during World War One in memoriam. There is an urn at the highest point of the facade. The organist amplified this effect by choosing his most macabre selections--Requiem in D, themes from Phantom of the Opera. Below this immense singing headstone danced merrimakers in dreadlocks to lyrics of defiance intoned to back beats. The fair opened with a parade, featuring Clingons from Star Trek, Horned Warriors from the Society for Creative Anachronisms, a six foot frog on the back of a pick-up truck, and a gaggle of ecstatic Krishna devotees, complete with a cow-drawn surrey bearing their gods in effigy. Festival booths offered a bedazzlement of environmental horrors to be ameliorated with contributions, an assortment of relatively healthful victuals, and environmentally conscious consumer goods, such as mine. The place fairly reeled with music besides the giant organ, a reggae band, and a rock band--I counted at least three folk singing acts, and three radio stations broadcasting pop hits during my stroll, and, between the live bands, the sound tech cranked up some sort of techno rock. There was a moment of respite at noon, when Robert Nanninnga, the ringmaster, introduced a series of speakers, including Earth Day Mom Carolyn Chase, the honcho of All This. The most passionate and interesting speaker turned out to be a gentleman from the Sierra Club, dressed in green for the occasion, offering visions of the wild mammals of San Diego County making their way to the sea through tunnels under the highway and creek corridors through the tony residential districts. It was good to pause for a moment and consider the proposed beneficiaries of all of this speaking and doing. Imagine being a coyote in San Diego County, or anyone else without a steady job or a trust fund. I got up and said my little piece. Happy Thirtieth Anniversary. 1970 was a year of critical mass for the environmentalist ideals of the 60's--the hundredth monkey effect kicked in and manifested as publications, organizations--The Mother Earth News, The Whole Earth Catalog, Living On The Earth, Earth Day. Now, in 2000, the environmental ideals of a century are coming into fruition. The green car. Whole cities with recycling programs. Environmentalism is a practical application of the spiritual ethic of compassion for all beings. It is accomplished through a rhythmic series of minute decisions. Hundreds of small decisions made on a daily basis equal a life that makes a difference. What we buy, how we dispose of waste, voting and for whom we vote, small contributions to big causes, teaching by example. Please buy my book. Thank you very much. 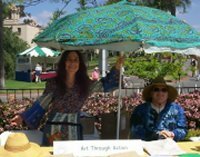 My wonderful friends Glenn and Chris worked with me from dawn to dusk, and the success of my booth is due in no small part to their efforts, as well as help from dancin' John Noble of In Harmony Herbs and Spices in Ocean Beach, where I will be signing books on April 27 at 3 PM.